The Two Lick Trail is a five mile loop trail that starts and ends in the Monongahela National Forest's Pocahontas Campground, only a couple of miles west of the Virginia/WV border near Lake Moomaw. 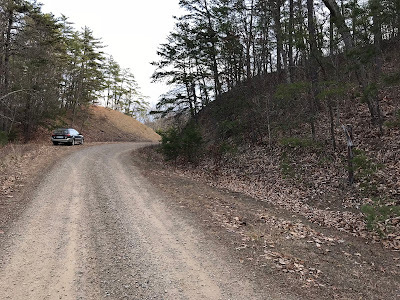 You get there by taking WV 92 either north from White Sulphur Springs or south from Virginia Route 39 just after it crosses the state border. It is only a few miles south of 39 near Rimel, West Virginia. Trail Map. I was out this way for other reasons, had a couple of extra hours, and decided to check it out. The trail starts next to a map kiosk in the day use parking lot, which is before the campground loop. Park here and the trail curves around to a nice bridge over Two Lick Run after 100 yards. A few hundred yards later, the trail forks. I took the trail counterclockwise, so I cut to the right here. There was another sign shortly after that, for the Two Lick Bottom Trail. Because the Bottom Trail starts and ends at the Two Lick Trail, you can choose either one and make the loop; I chose to stay on the original trail. The Two Lick Trail then crosses another bridge before gradually climbing the mountain through open hardwoods. 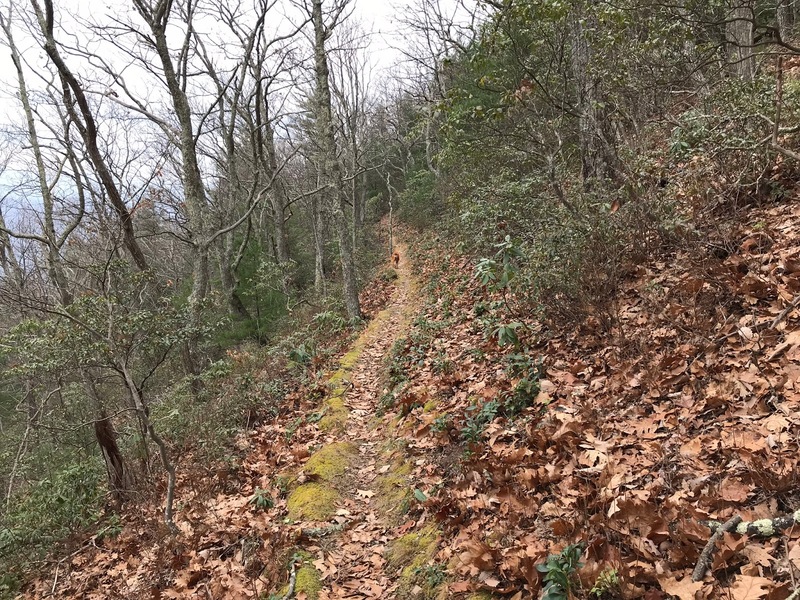 After only a mile, the Two Lick Trail intersects with the other end of the Two Lick Bottom Trail. 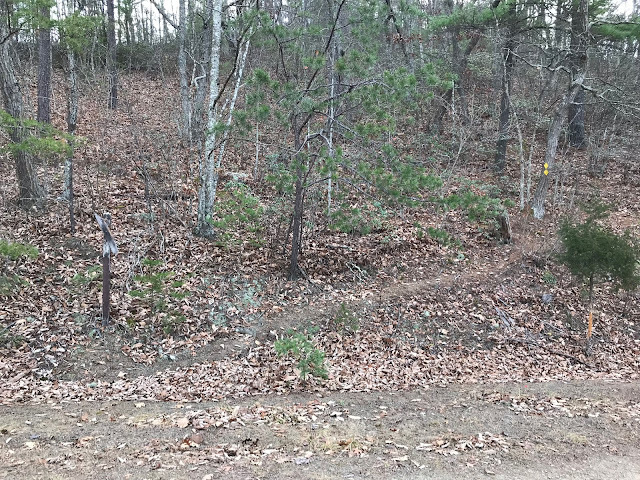 You could take this back for a really short loop, or keep going on the Two Lick Trail for more ascent and a longer loop. I kept ascending. The trail was wonderful for its solitude and late summer vegetation. Unfortunately, all the climbing really didn't pay off. The trail never summited the mountain - which would have had me at the state border. Instead it turned and rode the ridge below the summit. I think this is because, back when the trail was originally constructed, there was a road at the ridgetop, and it was decided to keep some distance from the road. But it means there wasn't much of a view, other than the limited view shown below, reached at the 2.4 mile mark, just after the high point on the hike. 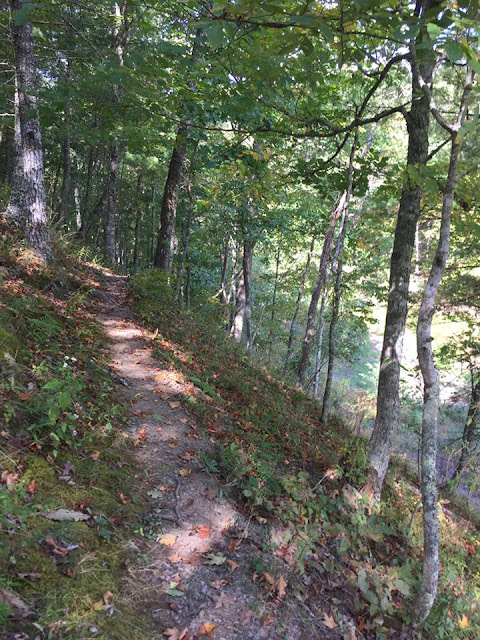 The trail hugs the side of the slope at its highest point. 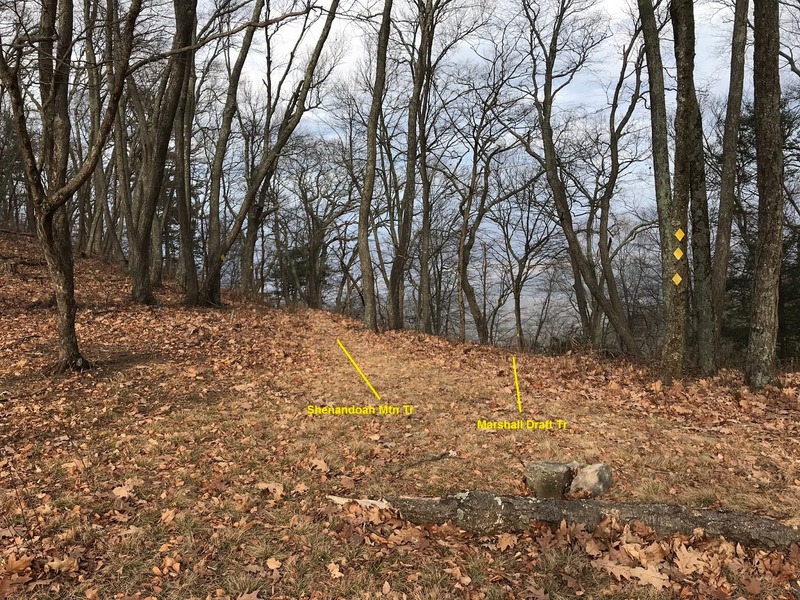 On the way back down, the trail crosses an old woods road, which the USGS topo map indicates continues up the mountain to the road on the summit. But the old road bed was overgrown with late summer vegetation. It did not look like anyone uses this route. The trail goes under a massive Chestnut Oak. The trail was in nice shape - very well maintained and generally was prolifically blazed with plastic blue diamonds. In fact the photo below had me thinking whether someone was paid by the diamond - there is no way to lose the trail here, with three diamonds over a space of 25 feet! The campground is a pretty spot, with nine sites, pit toilets and waste cans. The hand pump looks disabled, so there appears to be no water available here. The Blue Bend Campground, also in the national forest but about a half hour south, is a superior choice for a weekend adventure. It also has a five mile loop trail (into the Big Draft Wilderness), has showers and flush toilets, river swimming, picnic shelters, and access to the nearby Greenbrier River Trail for biking. I was scheduled to take my Boy Scout troop to Mt. Rogers for a 3 day backpacking trip, but for a bunch of reasons it could not work out - most likely because it was set up kind of last minute. 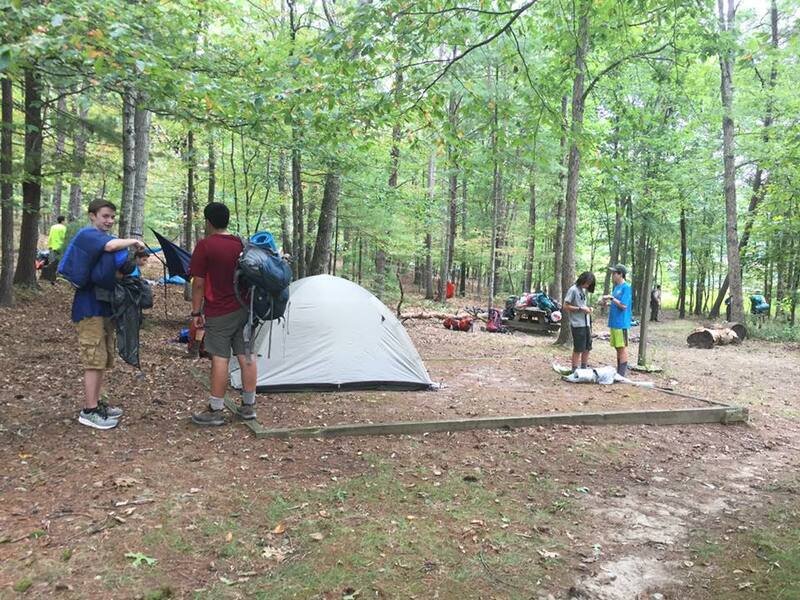 After discussing with the committee, we decided to backpack another weekend. My wife had made plans for the weekend that didn't include me, so I suddenly had a 3 day backpacking weekend last minute! Where to go? I had been out to the Cranberry Wilderness ("CW") once, briefly. Very briefly. Link. 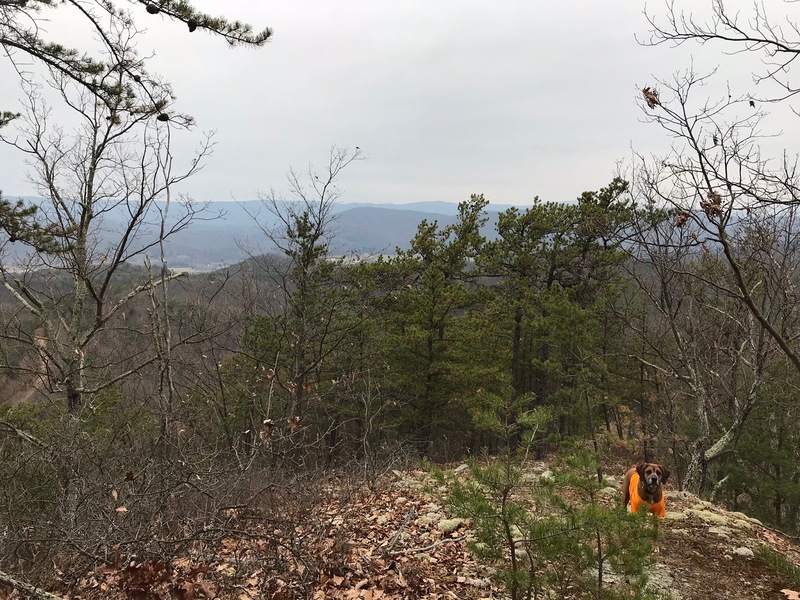 I had done 5 miles out and 5 miles back on the North-South Trail as a day hike, managing to get the hike in and be back in Charlottesville by 5 PM same day because everything went right. I wanted to go back and see some more. The CW is said to be the largest wilderness on the East Coast. Within the wilderness is the most remote spot in all of West Virginia and though the wilderness does not have a lot of elevation change and has few overlooks, it has a reputation for difficulty. I used a map I found online (Link) to plot a course, coming up with a nice large loop that would keep me moving much of the time and would have me out for three solid days of hiking. Some of the trails I would be using are described as less popular, which might mean a little solitude along the way. 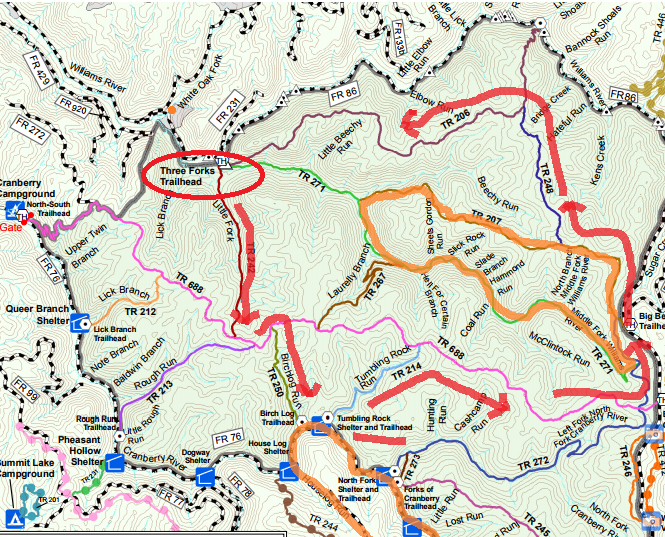 I took the route marked in red. 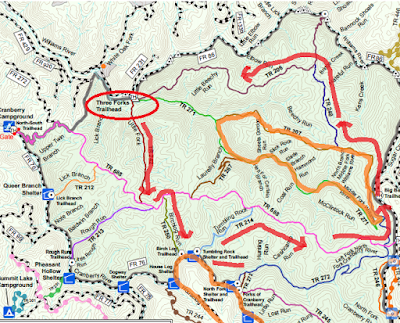 Routes marked in orange are the most popular in the wilderness. I started at the Three Forks Trailhead on the northwestern edge of the wilderness about noon on Friday. The trailhead was easy to get to and the roads were in great shape. When I arrived, there were no other cars in the lot. For navigation I was armed with the map linked above, a second version I had created giving mileage between trail intersections, a compass (which I always bring and seldom need, but it doesn't weigh much...) and my trusty handheld Garmin GPS - loaded with a WV topo and an overlay called "My Trails" which is usually pretty accurate though not always, and includes most (not all) of the trails in the CW. Empty parking lot at the Three Forks Trailhead, noon on a July Friday. It was packed by Sunday. Almost right away I had some trouble staying on the Little Fork Trail heading south from the trailhead into the wilderness. 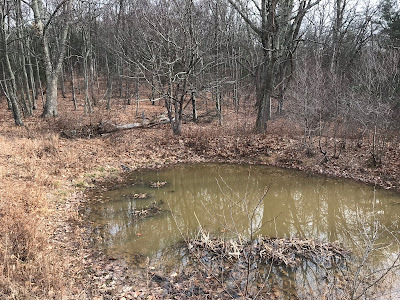 I attributed this to three things - my feet got wet almost right away because my "waterproof socks" weren't; there are a ton of interconnecting old rail beds in this part of the wilderness, and this is a less used trail - remember that my car was the only one in the lot. Many trails end at the Three Forks Trailhead. This stream crossing was almost immediate after leaving the trailhead. My feet were wet for the rest of the outing. But I was never too far off, and I used the My Trails overlay on my GPS to get back on the trail when the trail I was taking died, and I walked back downhill to reach the point where I messed up so I could figure out where I went wrong. Further south, the navigating was easier, and by the time the Little Fork Trail ended at the North-South Trail, I was moving at a good clip. One of many old rail beds in the northwest portion of the wilderness. The Little Fork Trail ended at the North-South Trail. 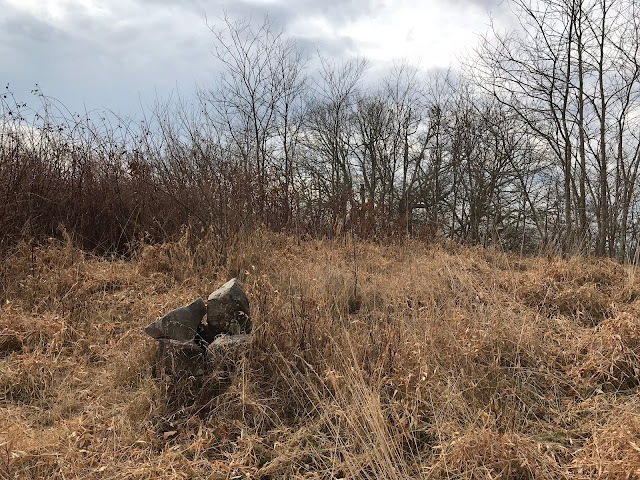 After heading east on the N-S trail and then turning onto the Birch Log Trail and taking it until it ended at an old gravel road, I made it as far as the Tumbling Rock Shelter by 4:30 Friday afternoon without further difficulty. This is one of multiple Appalachian Trail style shelters located just outside the wilderness boundaries along the South Fork Cranberry River, but seemingly still a long way from civilization. I was elated to find the shelter empty and set up dinner. By the time I had eaten, it started raining hard off and on. Even though I was stopping 5 hours before sunset, the idea of an empty shelter seemed pretty appealing. I don't usually stay in shelters because I don't want to wake up as some mouse is running across my head (and my research indicated that this shelter has them). But I set up the tent in the shelter and never saw a mouse. Or another person - all day Friday and not until about 11 AM on Saturday. Tumbling Rock Shelter from the road. South Fork, Cranberry River, from my campsite. Even so, I didn't sleep well - my fitbit records me waking 21 times - and by the time I was on the move again at 6:45 AM Saturday, I had hatched this plan that I might hike much of the way back to the car, overnight within three or four miles from the end of the trip, and get some additional trails in on Sunday. I blame my lightweight mattress for my insomnia, which isn't a comfortable as I would like, and I knew that a second bad night would make for a tough drive home. I estimated the total distance back to the car via the trails I wanted to take to be around 19 miles, well within my range. I continued east on the road, past a wonderful campsite that was hard to see from the road, and quckly came to the Tumbling Rock Trail. This was a 2.5 mile ascent which returned me to the North-South Trail segment I had hiked two years earlier. 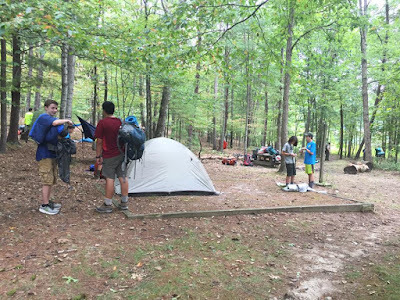 The N-S has several excellent campsites during its 5 miles, but it was way too early to stop. This part of the N-S Trail is in good shape and is exceptionally beautiful, though it is often very soggy and occasionally overgrown. Nevertheless, it is pretty level and easy to follow - you just have to accept having wet feet. I have included multiple photos taken along this section of trail. Some people should be banned from the wilderness. Like the folks that did this. 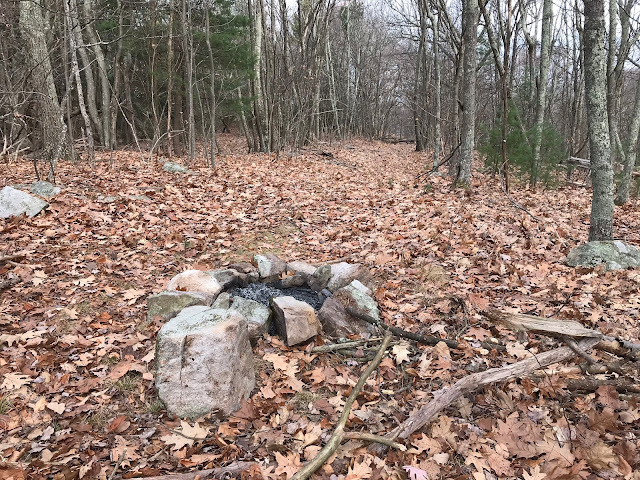 Near its eastern end, I came to an open area with a stone cairn where I left the N-S and took the North Fork trail north, and I found this section of the North Fork Trail to be beautiful and in great shape - the miles were flying by. I took a left off of the N-S Trail here. right alongside one of the few meadows I'd seen in the wilderness. I left the North Fork Trail just before it ended at the Highlands Scenic Highway, instead continuing north on the Big Beachy Trail. This section of trail was also in great shape, actually much easier to hike than any other trails in the CW. The beginning of the District Line Trail. I hit the intersection of the Big Beachy and the District Line trails at 1:00 sharp, right about at the 13 mile mark. 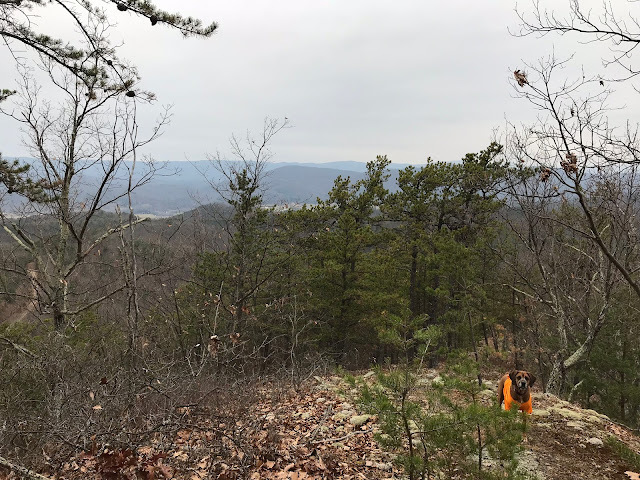 I remember thinking that I could continue on the Big Beachy to get back to my trailhead faster, but I still felt great and was excited to check out trails that hadn't been reported on hiking websites. I was a little nervous, though, because one of the few accounts I found had reported difficulty finding my next intersection - District Line and County Line Trails. But I figured that at my current pace, I'd be at that intersection around 2:15, as it was a little over two miles away. A trail is much harder to follow along the District Line route. I had a little more trouble keeping track of this trail, as it was clearly much less used than the trails I'd been on up to that point on Saturday. But it was marked at pretty regular intervals with orange or blue flagging tape, and the route was usually pretty obvious. In a couple of spots, I had to use the My Trails data on my GPS to get back to the correct route - fortunately the data was spot on. Other times, trees were down and it took some time to get around them and back on the trail. I had the District Line/County Line intersection marked on my GPS, however, and I had no problem finding it - at just a little before 3PM. I only had 7 miles left and still felt good. The District Line Trail ends here, and the County Line Trail curves to either head north to a trailhead at the Williams River (which I had seen on the drive in), or back to my car. It was fairly visible, but I was still happy to see flagging tape heading west. I stayed with the trail for about the next 1.2 miles, though it took me 45 minutes to get this far. The County Line Trail was horribly overgrown. Here, you can see old blazes and a piece of marking tape further ahead. 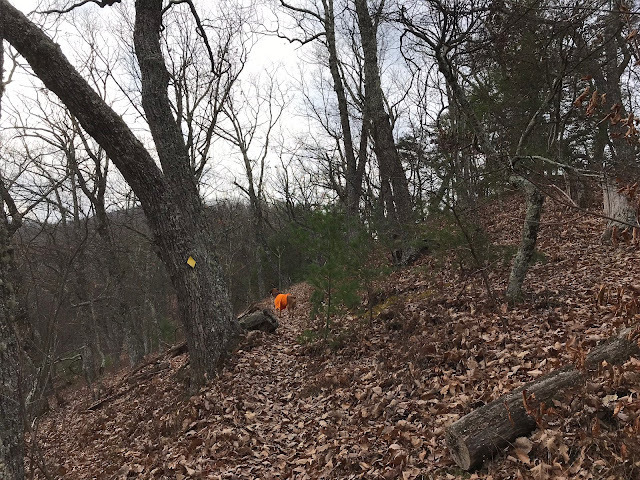 of the next 3 miles (1 hour 45 minutes) before I learned to trust My Trails implicitly and use it if I went more than 50 feet without seeing the next flagging tape. I could not camp along this route, and believed I would need every moment of daylight to get me back to my car. 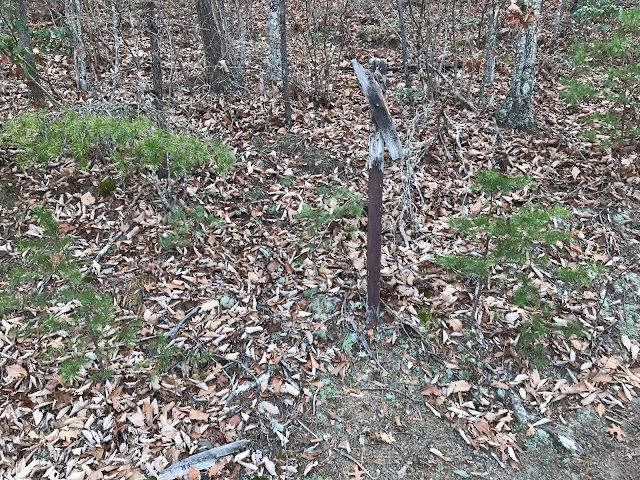 I seriously considered leaving my direction when I had been unable to find marking tape or evidence of an old trail for a significant amount of time. 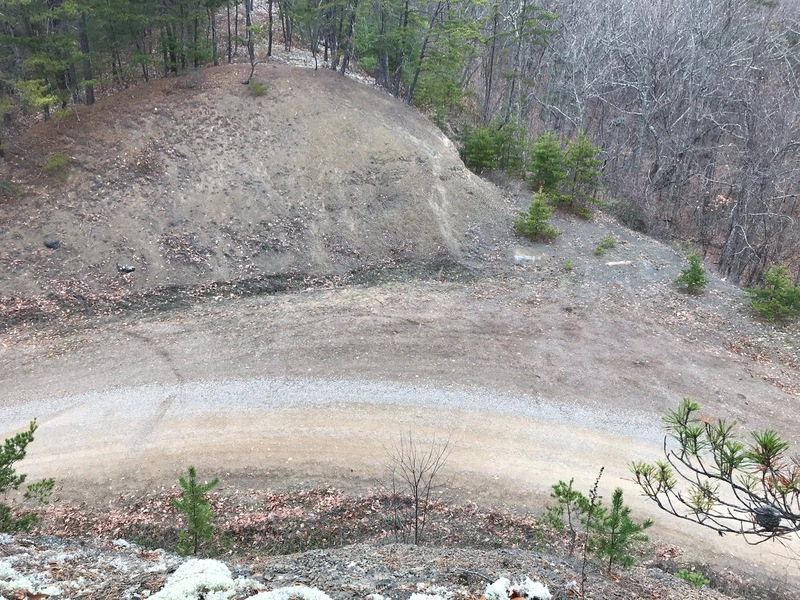 I could have dropped down the steep slope to the right (north) and eventually would have reached the access road I used to reach the trailhead. I did not because going that way seriously risked an even worse outcome. And by the time I was about 3 miles from the car the trail was generally easier to find, and by the last mile, there were even recent cuts to downed trees, indicating someone was trying to maintain it. For this reason, I am not writing the National Forest and asking them to take the trail off of their maps. Maybe it will get better sometime. But there were no campsites along the way. I made it back to the car at 7:51PM, over 13 hours after I had started hiking and needing 6:51 to hike the final 9+ trail miles. (My GPS records the final segment at 11.7 miles, while maps say it should be 7 miles.) I set a record for the most time on the trail in one day, though I've hiked much further in less time on another hike. I returned to a full parking lot, and everybody else parked in a different direction than my car - making me look like the jerk taking up too much space! I sat on the back bumper of my car and threw up. I had to stop the car on the way back to Marlinton (no way I was camping) to throw up several more times. A cheap motel was a wonderful gift to myself. Sunday morning at the Marlinton Motel. The My Trails overlay really saved my hide! I thanked the guy who compiles the data with a donation and an explanation, and I have sent him several tracks of Virginia trails that need updating. I highly recommend this overlay, in conjunction with a Garmin handheld GPS. Based on my experience here, I would recommend stopping at the Forest Service's Cranberry Mountain Nature Center, and inquiring about the condition of the trails. Be prepared to take an alternate route! This is a beautiful area, but it is also very unforgiving.